Signed and dated in plate to print l.r.corner, "Adrian Feint 26". 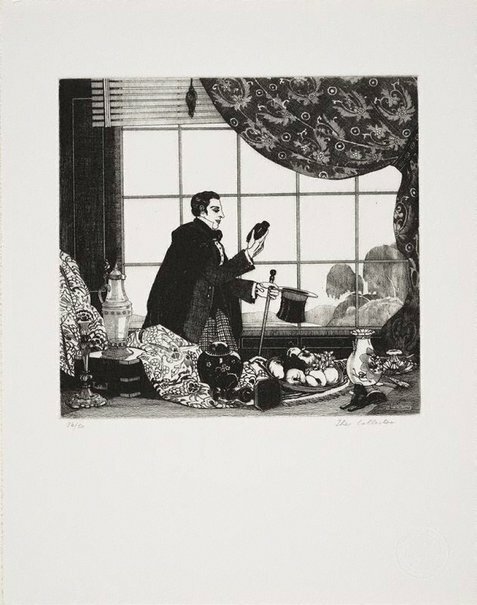 Roger Butler, Adrian Feint: Cornucopia , 'Chapter 4: Adrian Feint's prints and book art', pg. 29-31, Kent Town, 2009, 30 (illus.). Related work also titled 'The collector'; dated 1940; The Howard Hinton Collection, New England Regional Art Museum; Similar composition reversed.